I bought the gold one and it is lovely. Colors are beautiful and the quality is excellent. Spruce up your modern space with the Skegness pillow cover. Made from durable polyester, the nature-inspired print features two shades of leaves for added dimension. Choose from five versatile colors to complement your contemporary decor. 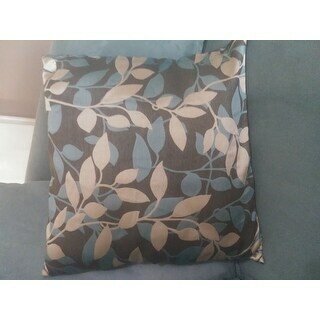 Really like these pillow covers - bought three different colors. Price was great. They are "small" 18x18 pillows however - I base that on trying to stuff an 18 inch insert into these cases - they are really "full" now - I guess it could have been the inserts I used? Anyway, colors and quality are great. Would recommend (just maybe use pillow inserts that aren't too fluffy?). Pretty covering. The colors are rich and it will definitely compliment my sofa. Purchased the blue and silver color, the color is more teal but it works well with the silver color. These are beautiful and brighten up my blue couch nicely. They are well-made and appear to be from quality fabric. They were a very good value, and easy to insert a pillow form. THey are generously sized, however, and I wish I had ordered 20 inch inserts for the 18 inch pillow covers. I am so happy with these pillow covers. 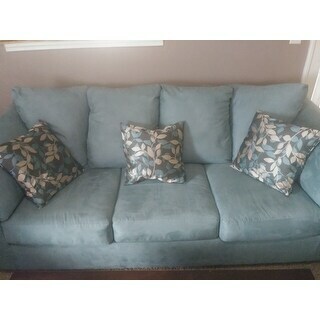 I tried real hard to find a teal color to match my couch and it turned out perfect. I was worried there would be too much sheen on the pillows but it's actually subtle. They are very well made. They have a hidden zipper and fits an 18 inch pillow perfectly. 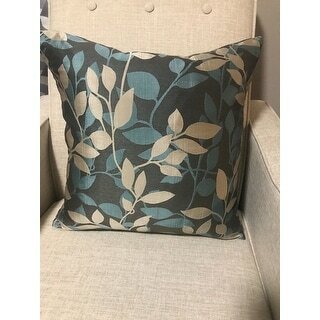 A great way to just change up the throw pillows you already have instead of spending all that extra money on new throw pillows. I would definitely recommend these pillow covers. Ordered in the black.... absolutely lovely on my charcoal grey sectional! Background is slightly gold with black and light grey leaves. Beautiful and sophisticated colors. I ordered the dark grey w/cream & dark teal blue leaves because of all of the other positive reviews & they did not disappoint! They look super lux & great quality in person & match my larger pottery barn pillows nicely. I can’t believe I got them do $10.50 each, because they look sooo beautiful! These pillow covers are absolutely gorgeous. I got them in three different colors, and I love each one. I was worried about the one with gold leaves, but it is spectacular. I would buy it again and highly recommend these! Truly need an 18-inch pillow insert. Tried to use an older 17-inch pillow insert and it just looks lame. We ordered this pillow for our newly decorated living room. The color is perfect and the quality is excellent! Good color and material thickness. Hidden zipper for the cover. Washable. Very nice. the purple is so nice, it is just the cover though - I put it over a brown pillow I have and it fit perfectly, the brown was too blendy blendy with my espresso couch. This offered some nice contrast. 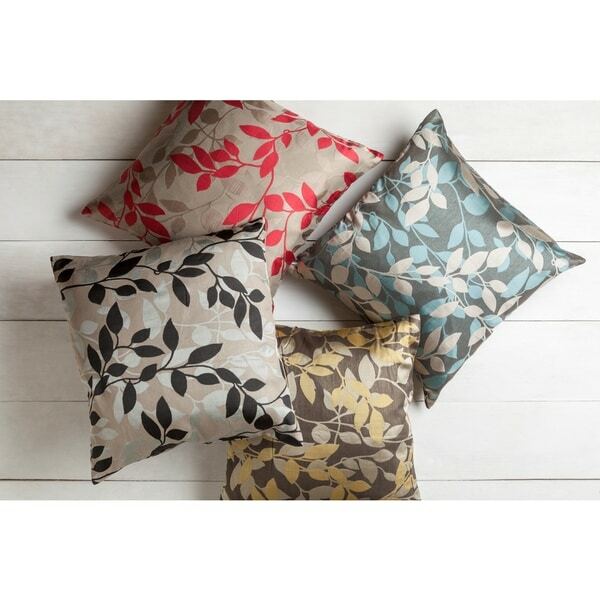 I DO LIKE THE IDEA OF A PILLOW COVER AND THESE LOOK GREAT ON MY COUCH. EASY TO PUT ON AND TAKE OFF MAKES THEM KEEPERS. OTHERS WILL BENEFIT FROM BEING ABLE TO CHANGE THE LOOK AND KEEP THEM CLEAN. This review is for the blue option. Be advised that the blue leaves are very, very turquoise and not the light blue depicted in the picture. "where do you find the pillows to go in the throw pillow cover. Do you have them there to sell also? I need 4 of the 18 x l8 pillow forms?" I had other pillows I wanted to cover, and they do have the larger size. I ordered the small ones 2 in a package. I love them. 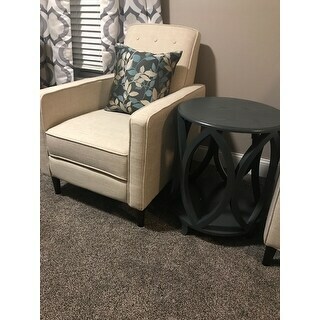 I matched with the rug I purchased from Overstock as well. The rug was an excellent buy as well. Very big in size. I bought the gray pillow which has soft green-grays and creamy colors. Not shiny, more like a satin finish, not matte or dull though. There's a little bit of a sheen, but not enough to call it shiny, in my opinion. More like a very nice luster than a shine. "When will the red pillow be back in stock? Thanks." Changed colors in a room and did not want to buy new pillows - just need new covers. It had the colors I was looking for and it is very classy looking.